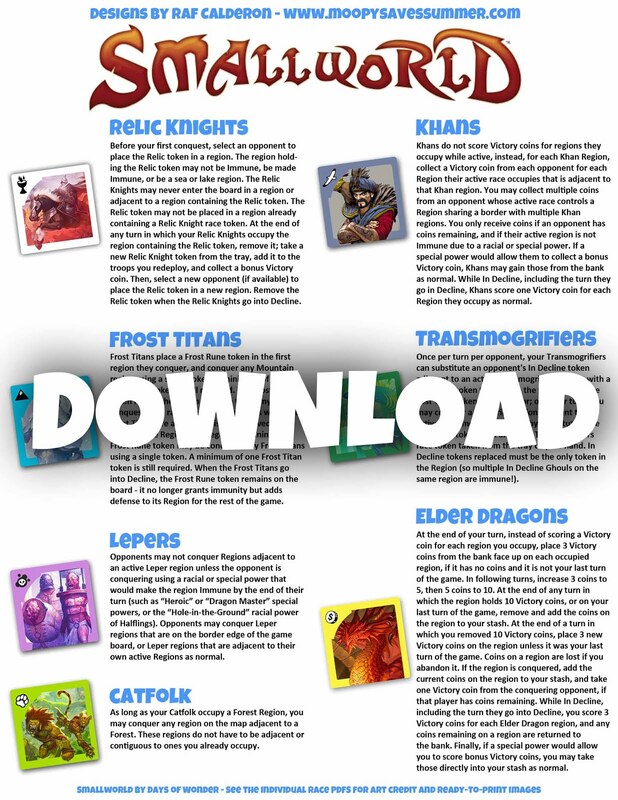 It's the last day of March so I'm making the last post for the Small World Board Game Month for the blog... but it's not the last of the Small World content I have to share. There's more to come including more races, special powers, and a few extras; but for now, named after my favorite variant of Magic the Gathering (similarities stop there), here's the Elder Dragons! At the end of your turn, instead of scoring a Victory coin for each region you occupy, place 3 Victory coins from the bank face up on each occupied region, if it has no coins and it is not your last turn of the game. In following turns, increase 3 coins to 5, then 5 coins to 10. At the end of any turn in which the region holds 10 Victory coins, or on your last turn of the game, remove and add the coins on the region to your stash. At the end of a turn in which you removed 10 Victory coins, place 3 new Victory coins on the region unless it was your last turn of the game. Coins on a region are lost if you abandon it. 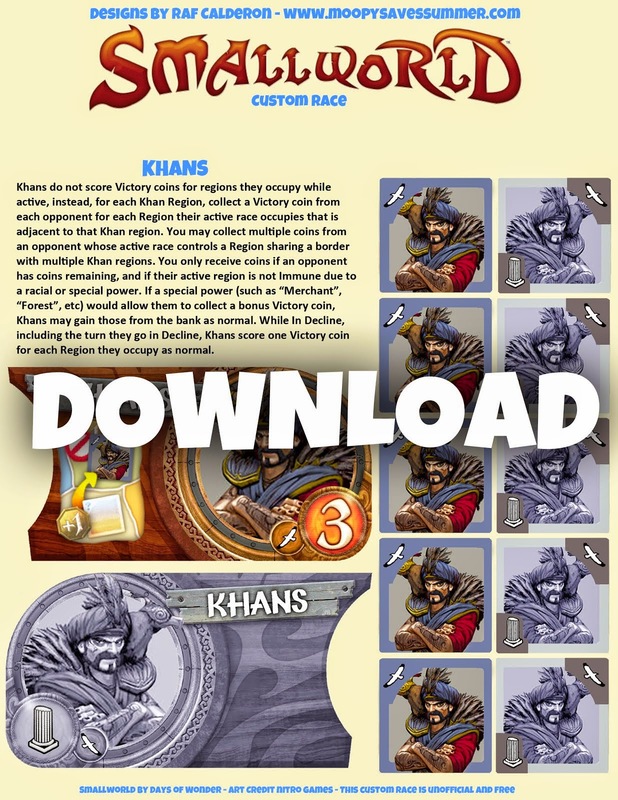 If the region is conquered, add the current coins on the region to your stash, and take one Victory coin from the conquering opponent, if that player has coins remaining. 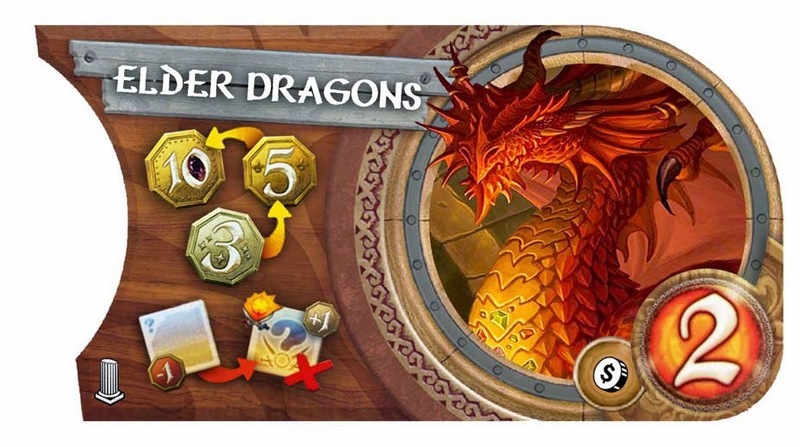 While In Decline, including the turn they go into Decline, you score 3 Victory coins for each Elder Dragon region, and any coins remaining on a region are returned to the bank. Finally, if a special power would allow you to score bonus Victory coins, you may take those directly into your stash as normal. A wall of rules text for such few tokens! 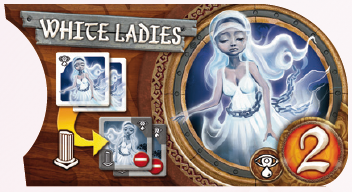 If you have played a lot of games of Small World and own or have tried different expansions (in this case, Grand Dames of Small World), introduced new players to the game, play the app, or have a regular gaming group, you have probably had White Ladies come up on the list of races. 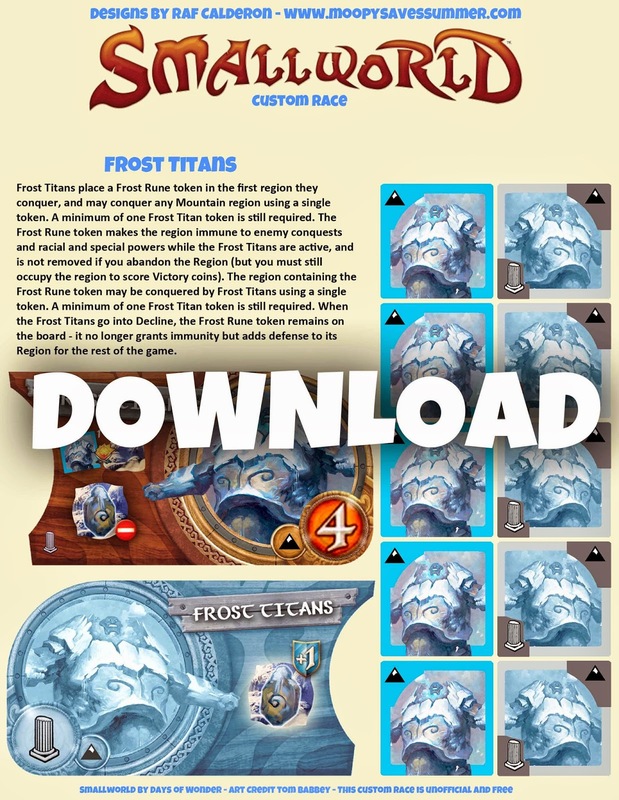 White Ladies are the only race in Small World that has two as their base token number, for a total of only 7 possible race tokens if paired with a special power that grants 5 tokens (9 total if you happen to get the Hordes of White Ladies combination). When you put White Ladies into Decline, each region they occupy becomes immune, forever yours until you put another race into Decline to take their place, but, if your experience has been anything like mine, they are seldom, if ever, picked. Even when explaining their rules to new players, instinctively, they tend to go for other race and power combinations that they feel sound like the better choice, and they're probably right. White Ladies occupy an interesting design space in Small World - they're the lowest population race in the game, have a powerful In Decline effect, but their success still hinges on them spreading out and holding regions, making them a poor choice compared to other alternatives. Despite their In Decline power, it's safe to say that they are universally considered the least powerful race in the game. 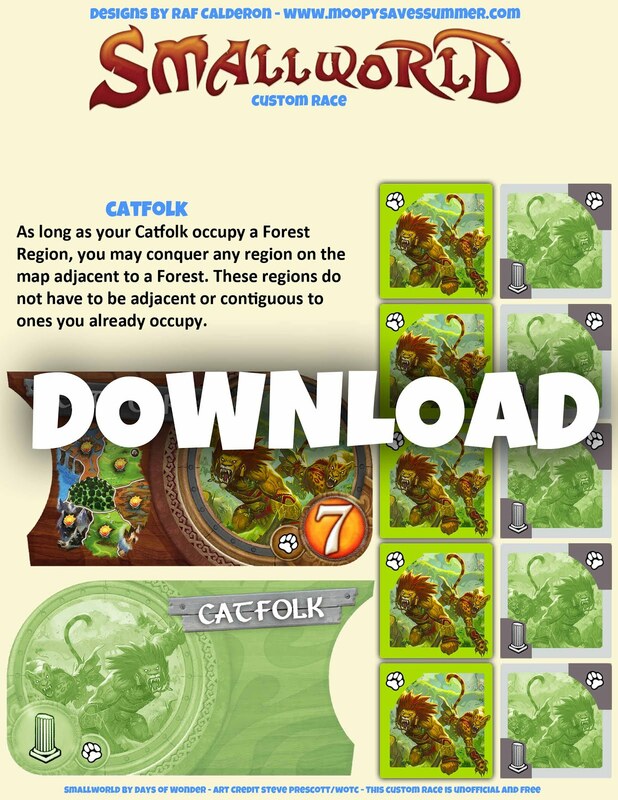 I wanted the challenge of coming up with something that would make an effective 2-token base race. For me, the answer to getting around the inherent weakness of low population was to allow the race to generate Victory coins by holding less while slowly building more. Thematically, the notion of a great ancient dragon in the vein of Smaug, greedily brooding over his hoard of treasure, not wishing to be disturbed (and exerting great wrath if someone does), fit this idea perfectly. 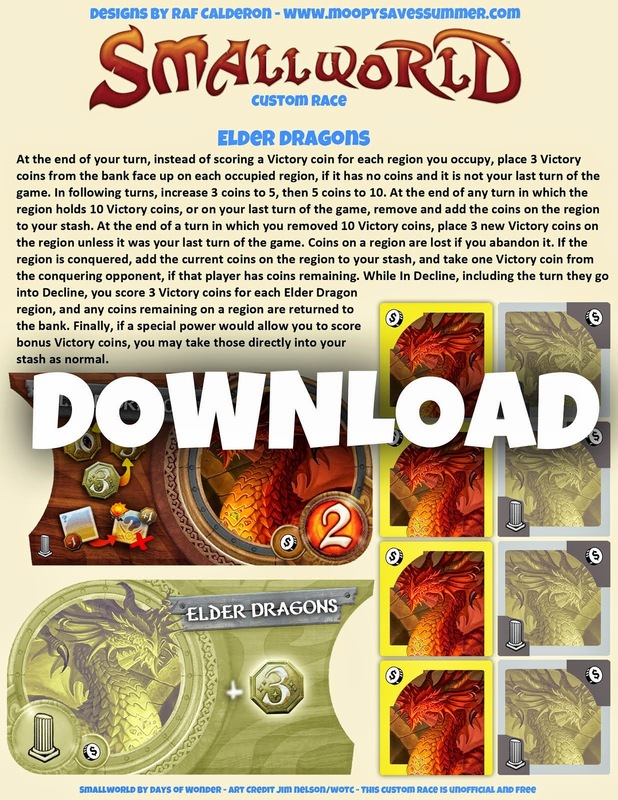 Part of the challenge mechanically was preventing the Elder Dragons player to be rewarded too hastily for their choice - it takes 3 turns of occupying a region after the initial conquest (then again every 2 turns thereafter) to generate 10 Victory coins for it, during which your opponents will have ample opportunity to stop you. However, in doing so they will gain no benefit for displacing you from your lair - they'll have to give up a Victory coin, essentially earning none for their conquest. This means that in a multiplayer game, someone is going to have to bite the bullet, or allow you to go on. The Elder Dragons player is also losing a lot in this interaction - by holding less regions, more areas of the map are opened up to your opponents, who may then spread out, Decline, and move on to their next race, leaving you in a world of hurt when you finally decide it's time to put the Dragons out to pasture and the board is full of enemy tokens both declined and active. 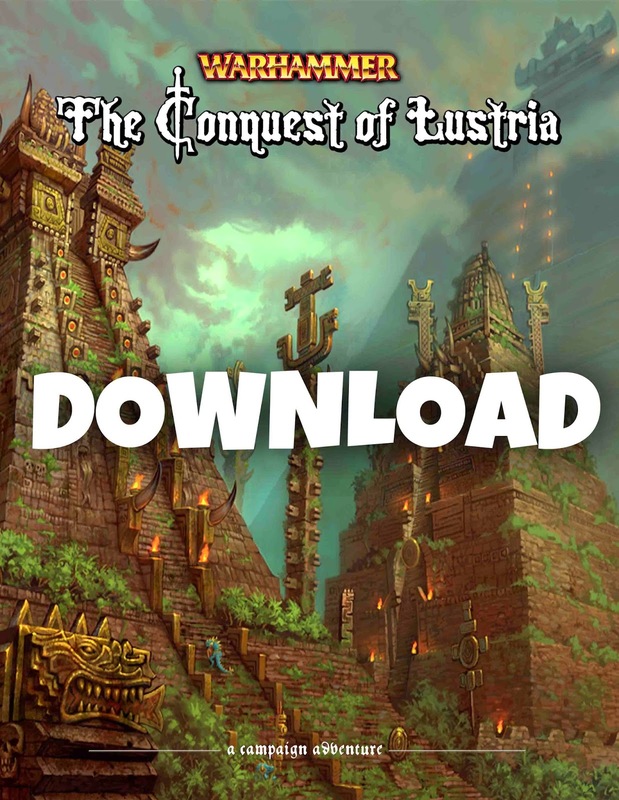 In addition to this, by being conquered, you lose a token, making it much harder for you to overcome diminishing returns and claim regions to replace the ones lost - better have that reinforcement die ready. In decline, Elder Dragons generate 3 Victory coins, including the turn you put them into Decline. You're not likely to be spread out over many regions, so your opponents will want to stamp out the In Decline Dragons as soon as possible. This is also useful early on in the game, when you may not want to stick with Elder Dragons for the amount of turns it will take to earn substantial paydays. 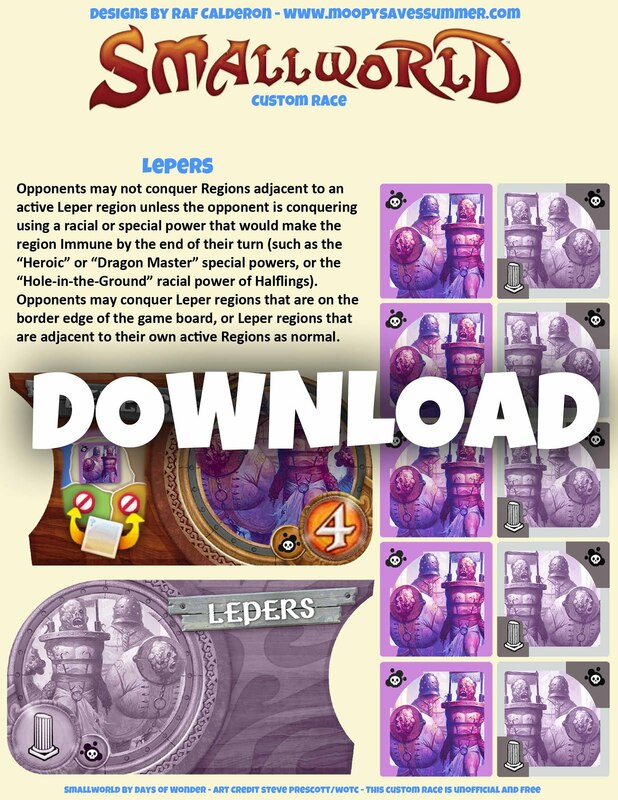 In the early game, Elder Dragons are especially great with the Stout special power, allowing you to collect a decent payday while forcing your opponents to begin by conquering your in Decline regions, and the Underworld, Seafaring, and Flying special powers, which will allow you to spread out over the map and be harder to reach in one go. When you want to stick with them for a longer period of time, especially in the mid to late game, defensive special powers such as Fortified, Heroic, and Bivouacking are great. I love all the races you've done for Small World! I agree about the weaknesses of the White Ladies- they are almost never chosen in my group as every sees them as underpowered. 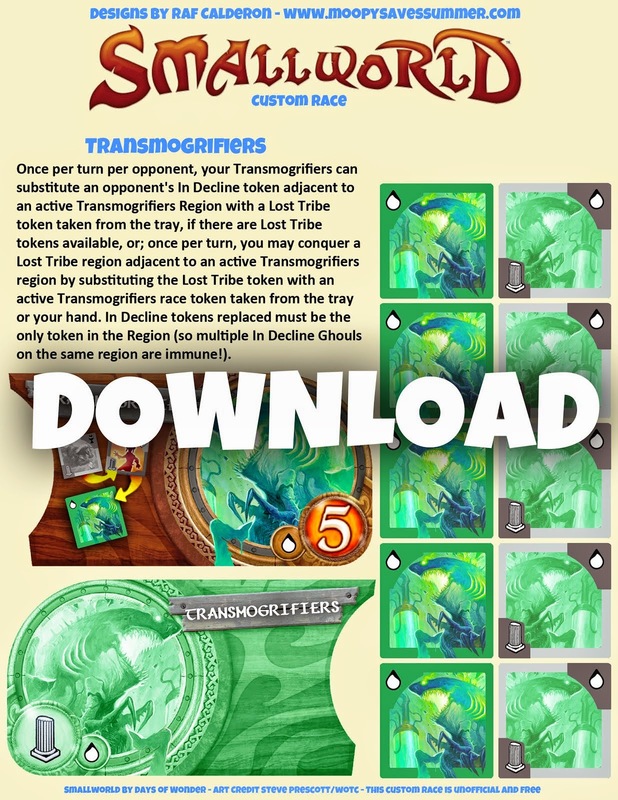 Also, how did you get your race boards and tokens to look so perfect?! My wife and I recently tried making a few with some chit board and cut them out using an X-acto knife. Any tips? 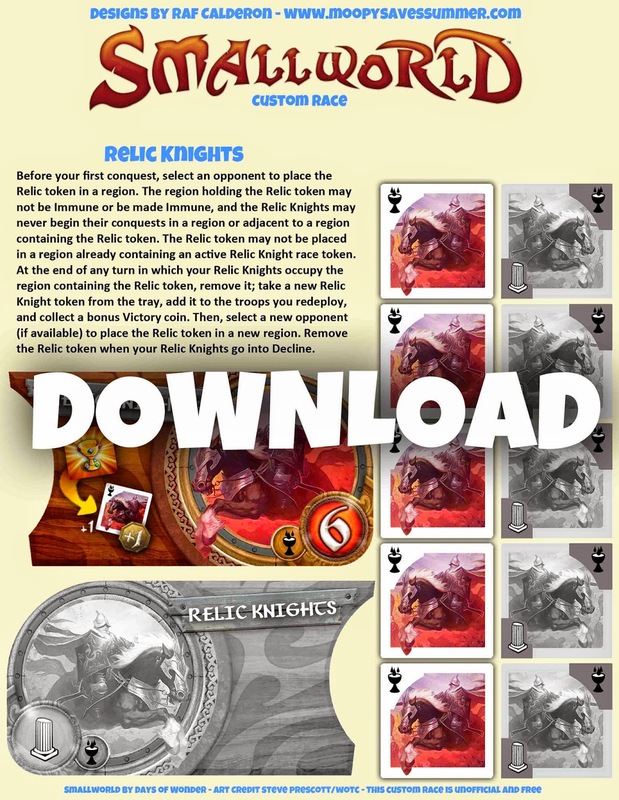 I had the PDFs printed at a local print shop on high quality (100lb) glossy paper, then cut the pieces out with an x-acto knife and pasted them on spare small world cardboard pieces with a glue stick (the game comes with a few blank race banners, but I bought a spare "Be Not Afraid" expansion for race tokens, miscellaneous pieces, and the tray). Then i sealed up the finished pieces with a light spray of testor's dull cote. As printing(ink) isn't cheap: Why didn't you put the items to be printed on plain, white backgrounds instead of in colour soaked pages? That's a lot of wasted time, and ink, printing on areas that will be tossed int he garbage. 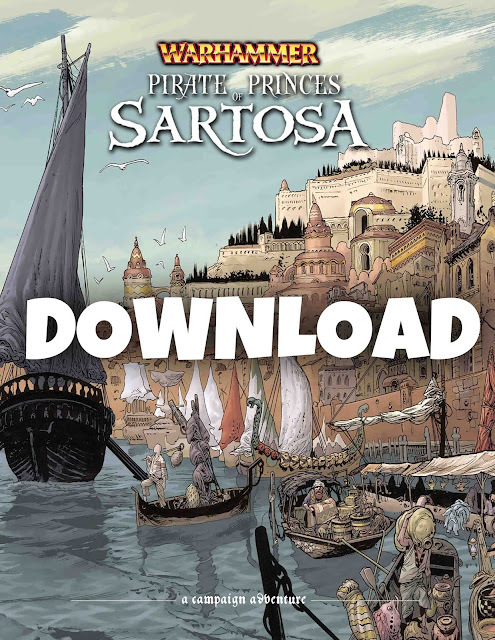 I had mine printed at a print shop which I highly recommend as most charge a a flat fee per copy, but I totally understand that the pages can be taxing on resources for people printing at home. A totally white background was really stark and since these were as much a personal design exercise for me as they were for the community, i went for the more aesthetically pleasing route.